To view the latest video streams on the strikes in Yugoslavia, use the arrow buttons below to scroll through the video gallery. BELGRADE, Yugoslavia (CNN) -- A NATO attack on Serbian television -- a day after another raid smashed the home of Yugoslav President Slobodan Milosevic -- prompted hard questions for the alliance Friday as it prepared to mark its 50th anniversary. NATO missiles blasted the building that houses the main studios and newsrooms of Radio Television of Serbia, knocking it off the air for several hours. Alessio Vinci, CNN's correspondent in Belgrade, reported that at least nine people were killed and 18 taken to area hospitals with serious burns. NATO defended the attack, saying the network is part of a "propaganda machine" supporting the Milosevic government, which NATO accuses of conducting a campaign against ethnic Albanian civilians in Kosovo. Goran Matic, a Yugoslav government official, said NATO's strike was a "criminal act." NATO leaders meet in Washington on Friday, as the allies' anniversary celebration has been overshadowed by the air war in Yugoslavia. NATO has complained several times that Serbian media were offering a distorted picture of the campaign, and hinted that broadcasting facilities could become targets. In London, meanwhile, British officials faced tough questions about the attack from reporters Friday. Several asked how civilian television technicians became military targets. "This is a war," said Clare Short, Britain's international development secretary. "This is a serious conflict, and untold horrors are being done, and the propaganda machine is prolonging it." She added, "There was no targeting of civilians." Short also cited numerous accounts from refugees of Serb attacks on civilians in Kosovo, including the reported killing of about 150 men near Pristina and shelling of refugees in mountain passes along the province's border with Montenegro. "I do ask you to take into account the harm that's being done to people in Kosovo," she said. "In that context, it is a legitimate target." Vice Admiral Ian Garnett, Britain's chief of joint operations with NATO, said Serbian television's studios as well as transmission facilities had to be hit in order to knock out the network. Asked why television studio crews were being attacked while Milosevic was not being targeted, Short said no individual was being targeted. The television station resumed broadcasting from another location within five hours of the attack. CNN's Brent Sadler said firefighters continued to douse the flames for hours. Serbian television is the main source of broadcast news and entertainment in Yugoslavia. 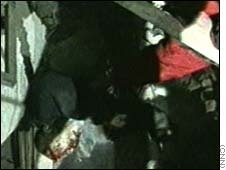 It was airing an interview with Milosevic at the time of the attack. The attack came in a night of what Sadler said was the heaviest attack on Belgrade since bombings began a month ago. 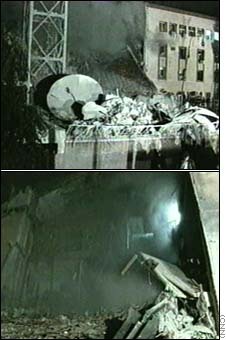 Novosti, a Yugoslav newspaper, and Beograd.com, a Web site based in Boston that is run by Yugoslav expatriates, posted photos of the damage. Thursday, former Russian Prime Minister Viktor Chernomyrdin said Yugoslav Milosevic had accepted the idea of allowing an international force in Kosovo under a U.N. mandate. However, official Yugoslav sources told CNN the plan calls for an "unarmed presence" that would exclude NATO countries with the possible exception of Greece. 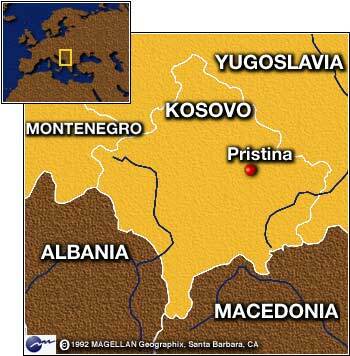 NATO previously has insisted that any peacekeeping force in Kosovo be armed and under NATO command. Milosevic has so far rejected NATO's demands to pull his forces out of Kosovo and grant autonomy to ethnic Albanians in the province. Following a meeting with Milosevic in Belgrade, Chernomyrdin said Yugoslavia was willing to accept an international body, but "what kind of international forces they will be or from which countries -- this is yet to be discussed." Chernomyrdin said under the agreement, Russia would participate in the Kosovo force. U.S. President Bill Clinton reacted cautiously upon hearing the report, saying he didn't know much about the proposal, but "if there is an offer for a genuine security force, that's the first time that Mr. Milosevic has done that, and that represents, I suppose, some step forward." Later, a U.S. official dismissed the proposal, calling it "a classic Milosevic propaganda ploy designed to divide the allies on the eve of the NATO summit." U.N. Secretary-General Kofi Annan said he was encouraged by news that Yugoslavia would accept an international presence in Kosovo and "eagerly awaits the details," according to a statement through his spokesman. A statement from Milosevic's office made no mention of an international force and gave no indication the Yugoslav president had softened his hardline stance. It said Milosevic and Chernomyrdin "condemned the aggression of (the) NATO pact ... and stressed that it must be stopped without further delay." "Yugoslavia and Russia are firmly determined to jointly work for a peaceful resolution of the problems in Kosovo, and that can be achieved only through political means," the statement said. Overnight Thursday, NATO jets bombed one of Milosevic's Belgrade homes in an example of "increased allied pressure on the very center, the central nerve system of the regime that controls military and security forces," Pentagon spokesman Ken Bacon said. Bacon said the alliance was not targeting Milosevic or his family, but, "we believe there were bunkers in this facility and in many other facilities." The residence, one of two homes Milosevic keeps in the Yugoslav capital, is located in Belgrade's luxurious Dedinje district. 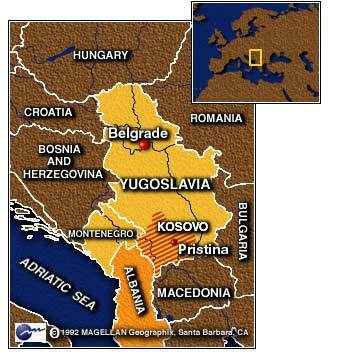 The attack came at 4 a.m. (0200 GMT), the Yugoslav news agency Tanjug reported. Serbian TV showed footage of what it said was the home. It showed significant damage to the residence in a tree-lined neighborhood near the grave of former Yugoslav communist leader Marshal Tito. U.S. and British officials said Thursday that Milosevic's home contained a bunker and communications facilities that made it a legitimate military target. "The house has been used as a command-and-control facility, and therefore it became a part of the military machine," Armed Forces Minister Doug Henderson said. Asked if NATO considered the Yugoslav leader a target, Henderson said, "The Milosevic military machine is the target, and there is no other target." 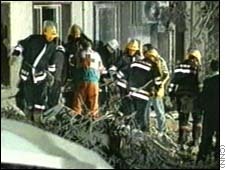 But Nebojsa Vujovic, a Yugoslav foreign ministry spokesman, said bombing the Yugoslav leader's home served no military purpose. "There were no single elements of so-called or alleged command-and-control centers, no single piece of wire, no single button," Vujovic said. NATO air raids have knocked out all of Yugoslavia's oil refining capacity, while damaged road and rail links have cut supplies to the Yugoslav army in Kosovo by half, senior officers said Thursday. U.S. Navy Rear Adm. Thomas Wilson, director of intelligence for the Joint Chiefs of Staff, said the attacks are hurting Yugoslav forces in other ways as well: There are higher desertion rates and fewer reservists showing up for duty. Wilson said there have been "several hundred" desertions from the Yugoslav forces based in Pristina, Kosovo's capital, alone. A reported Yugoslav campaign against ethnic Albanians in Kosovo has left dozens of towns and villages razed, he said. Numerous towns -- particularly in central and southwest Kosovo -- have seen more than three-quarters of their buildings destroyed or damaged, he said. "This is a wanton and indiscriminate destruction of this country's cities and villages," Wilson said. "There is a lot of evidence of mass killing." Going into the air campaign March 24, NATO allies estimated the Yugoslav army in Kosovo numbered about 40,000 troops, backed up by roughly 400 tanks and armored vehicles. Wilson said between two-thirds to three-quarters of those have been in the field, and about 10 to 20 percent of those have been hit by allied bombs. As NATO leaders gather for the alliance's 50th anniversary summit, which begins in Washington on Friday, NATO Secretary- General Javier Solana authorized allied planners to "update the assessment" for the possible use of ground troops in Yugoslavia. Gen. Wesley Clark, NATO's supreme commander, will review the allies' contingency plans. Despite that, Henderson said, the allies remain committed to the air campaign. "The difficulty of a land force invasion of Kosovo against an undegraded Serb military machine are formidable, but all options are always kept under review," he said. Early estimates suggest that more than 200,000 NATO troops would be required for a ground war in Yugoslavia. Military officials told CNN that number likely would be higher after Clark's reassessment. Sources in Washington said his review is routine, and in no way suggests a move toward seeking approval from the 19-member military alliance for a ground combat operation. The White House said Thursday it remained opposed to putting U.S. or NATO ground troops in Kosovo, except as a peacekeeping force. Correspondents Alessio Vinci, Jonathan Karl, John King and Brent Sadler contributed to this report.